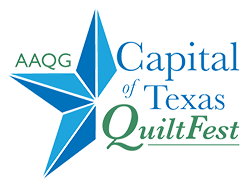 The center triple feathered star block of the Austin Area Quilt Guild’s 2016 raffle quilt was designed by Marsha McCloskey as published in her book Feathered Star Quilt Blocks I. Other design elements were adapted from the book Flock of Feathered Stars by Carolyn Cullinan McCormick. The center blocks of the stars were designed in EQ7 software by Deborah Goltra. These designs have been used with the permission of the authors and designers.